The altar depicting the Last Supper in mosaic was modified for the "new" liturgy & the new church. The holy water stoup was retained & is at least 60 years old. How many people have used this stoop to bless themselves? The Statues of the Sacred Heart & Our Lady & Child are the only other statues that continued to adorn our new church from the old one in 1978. Denis Parsons M.B.E. – Artist in wood and stone. 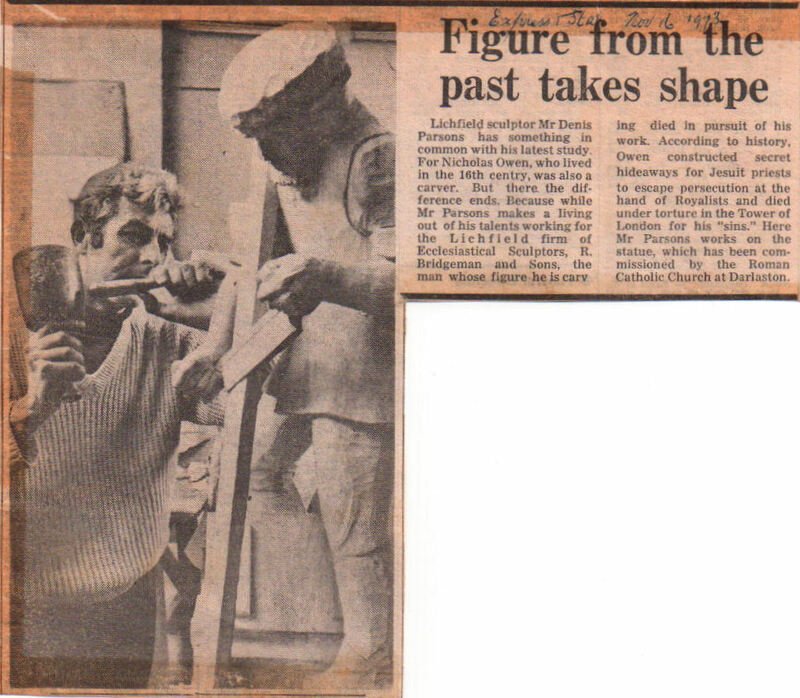 In the late 1970’s Fr Antony Owen commissioned Denis Parsons to sculpture four statures to adorn our new church : the lime wood statues of the Risen Christ, St Margaret Clitherow, St Nicholas Owen and St Joseph. 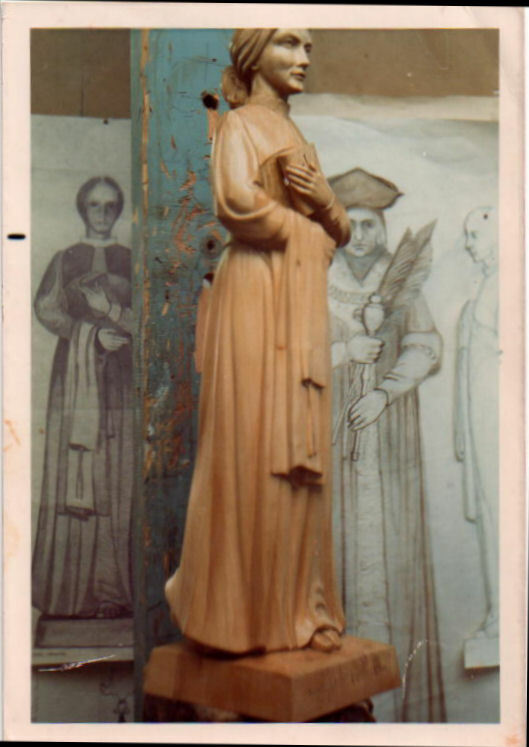 These original statues are unique and no other church has such a collection of distinguished works of wood sculptor. 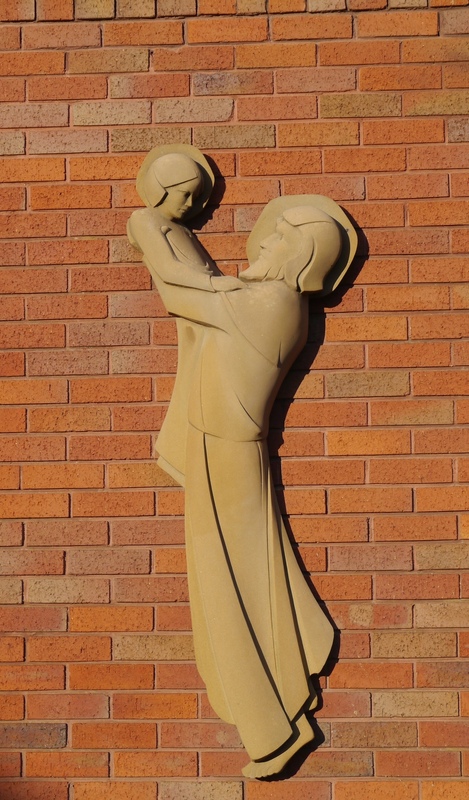 In addition a York stone relief of St Joseph and the child Jesus was commissioned and is now situated on the main entrance wall of our church. 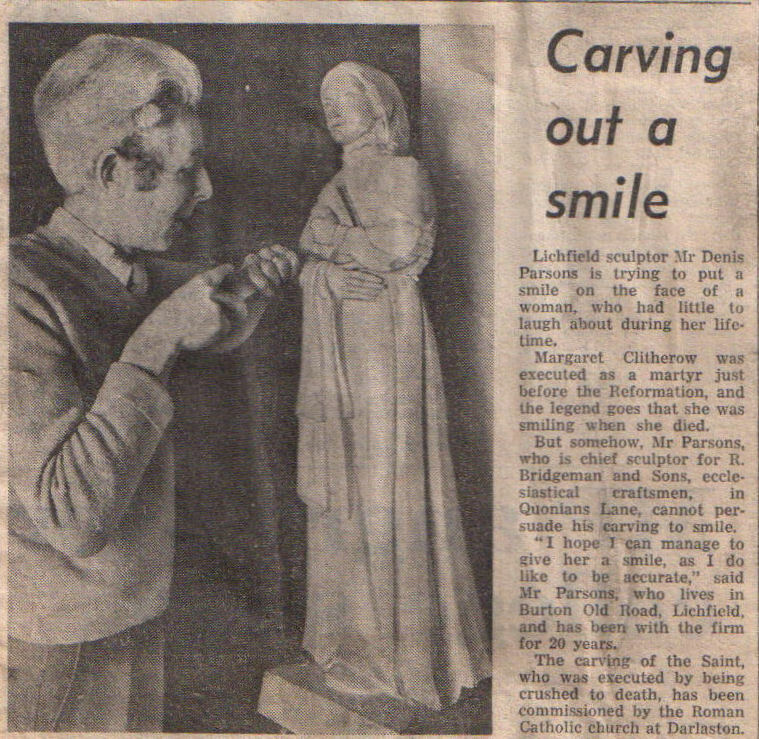 Denis Parsons was one of the last traditionally-schooled craftsman in a long British carving tradition. In a career lasting over 50 years he established an enviable reputation in the field of wood and stone carving His work can be found in many great buildings across the UK and beyond – Including St Paul’s Cathedral, Westminster Abbey, The Houses of Parliament and most notably St Joseph’s Darlaston. His skills were often called upon during major conservation projects. 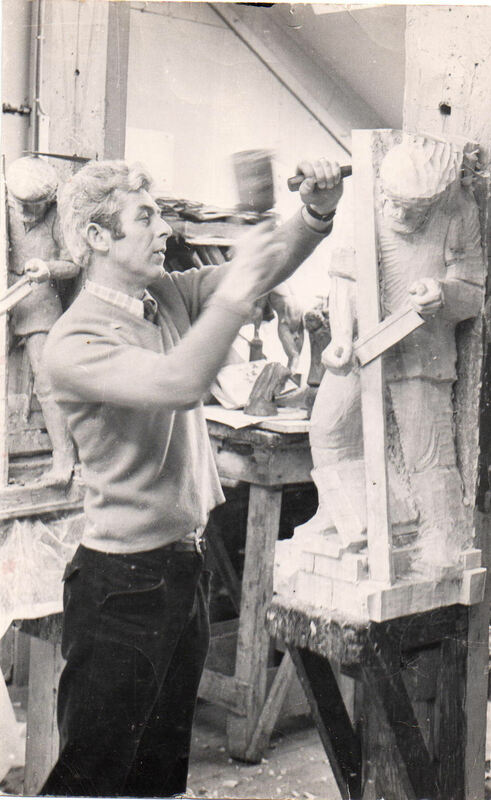 During the 1950’s Denis served a seven year apprenticeship with Robert Bridgeman and sons, Lichfield, a leading company concentrating on architectural and ecclesiastical carving and sculpture. It was at Bridgeman’s that Denis acquired the many traditional skills from his fellow workers. Skills that had been handed down through the generations which are now increasingly being forgotten. Denis derived great satisfaction from knowing that his pieces brought comfort and pleasure to generations of worshippers. Denis was in demand as a teacher and lecturer and demonstrated at the Royal Academy and also the Royal Fine Art Commission in the presence of Her Majesty the Queen. In 1993 he was awarded the MBE in recognition for his services to conservation. Born near Polesworth, Denis spent his whole working career in the Midlands. In the custom of many artists & sculptors, the statues are marked with a small Bee on the base.